Have you ever seen something that you just had to try? Perhaps a recipe, a patio table, or even a new route to a familiar place. For me, it’s almost always a fabric thing and if I don’t jump on in right away, it ends up in the forgotten, “Someday” file. That file exists in my head, but I’m working on getting it out of there and into a digital format. This table runner was one of those things. The pattern is called, Triangle Frenzy™ Swirl. I love the simplicity of cutting only one fabric and ending up with an eye-catching design. 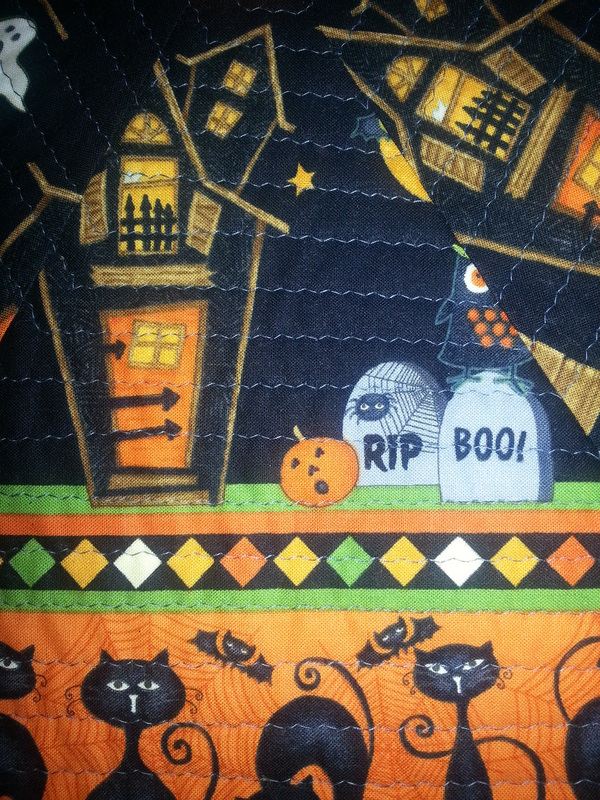 I chose Halloween themed fabric, well cause it’s that time of year and it was on sale. I made the larger one first and had enough fabric to make the smaller one. They will find homes with my two daughters. I considered a few quilting options, but I’m really practicing not over thinking things and not making them more difficult than they need to be. I pulled out my walking foot and went to work. 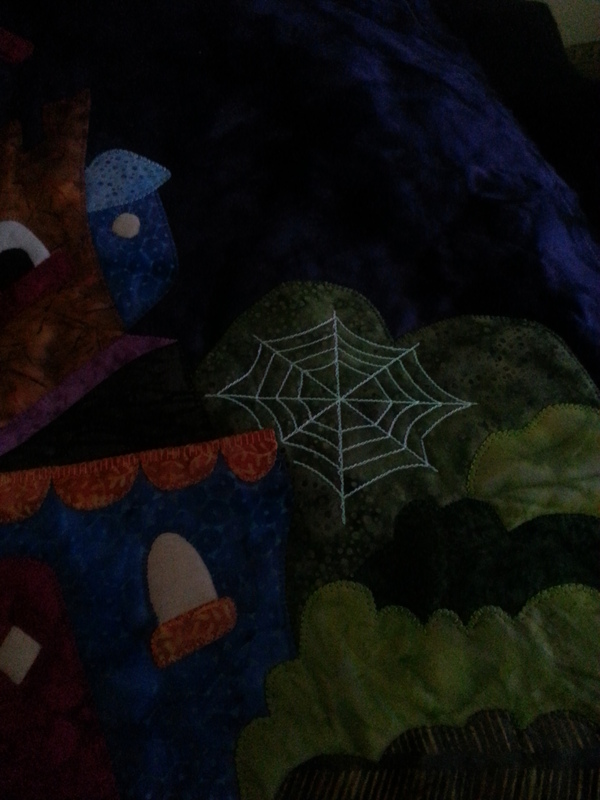 I used a very narrow zig-zag stitch; perfect for the Halloween theme and much more forgiving than a straight stitch. I now have a few go to table runner projects for when the mood strikes. Anyone who has been quilting for a few years and doesn’t have a UFO is lying. (ok, that’s a little harsh) Let’s face it, even that idea in your head is unfinished. For those of you who are not quilters, a UFO is an UnFinished Object. 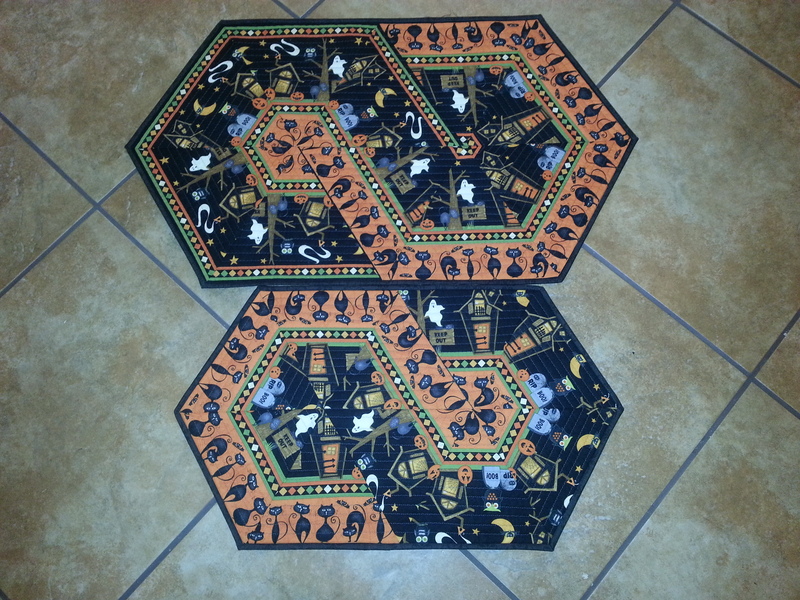 I have a few myself; including 2 quilts that are year-long blocks of the month. Each quilt has 11 finished blocks and both are safely tucked away in labeled project boxes. In addition to started projects, I have a number of items waiting for take-off. The first one: How does one create a UFO? This is quite simple. You are working on a quilt for yourself in the colors of your bedroom. You spent hours picking out the perfect fabric and the pattern is a little challenging, but not too far beyond your capabilities. Then one day you’re out with friends and you find yourself in the local quilt shop. There is a beautiful display of the cutest holiday wall hanging made out of the most delicious fabrics. YOU HAVE TO HAVE IT! After all, they are selling kits. Then you get a phone call announcing an expected baby. You just HAVE to make them a quilt. This scenario repeats itself over and over again. Some of these join your unfinished bedroom quilt. The number of your UFOs is multiplying. The second question: What prevents you from finishing these projects? Let’s revisit the bedroom quilt. It has now been 2 years since you first took your rotary cutter to the fabric. Some of the blocks are completed; some not. We now have more obstacles. You’ve repainted your bedroom and replaced the chair because your dog ate it a year ago when she was just a puppy. The fabrics aren’t so perfect anymore. Secondly, you are two years (or more in most cases) better at your craft. I think this is a huge factor. 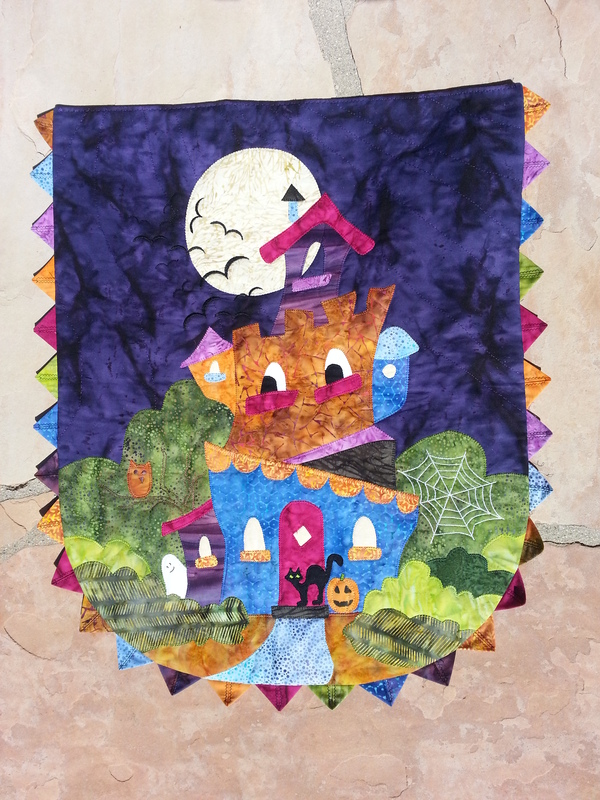 I bought a store cut stripper quilt kit a number of years ago. When I finally got around to cutting, a lot of the strips had started to ravel. Right off the bat, my pieces were already the wrong size and I didn’t have enough experience to adjust my seam allowance to compensate. 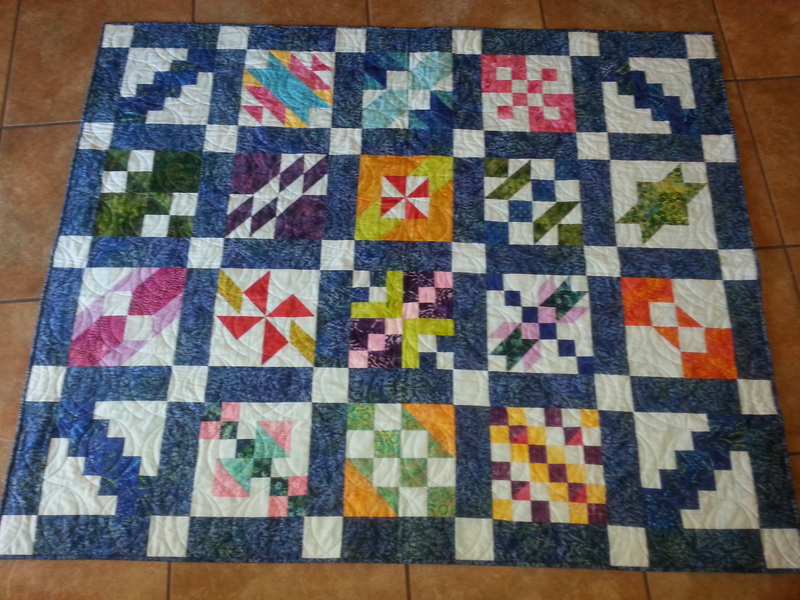 I pieced half the quilt and again set it aside. When I finally brought it out again, there was nothing I could do to fix what I had already sewn short of ripping it all out and starting over. This quilt has found a home on my patio. A sea of stars with cut off points. I’m not super pleased with it, but it is a constant reminder of how far I have come. Take some time to look at your UFOs. Do you still love them? Do you really want to complete them? If the answer is yes, then challenge yourself to do so. 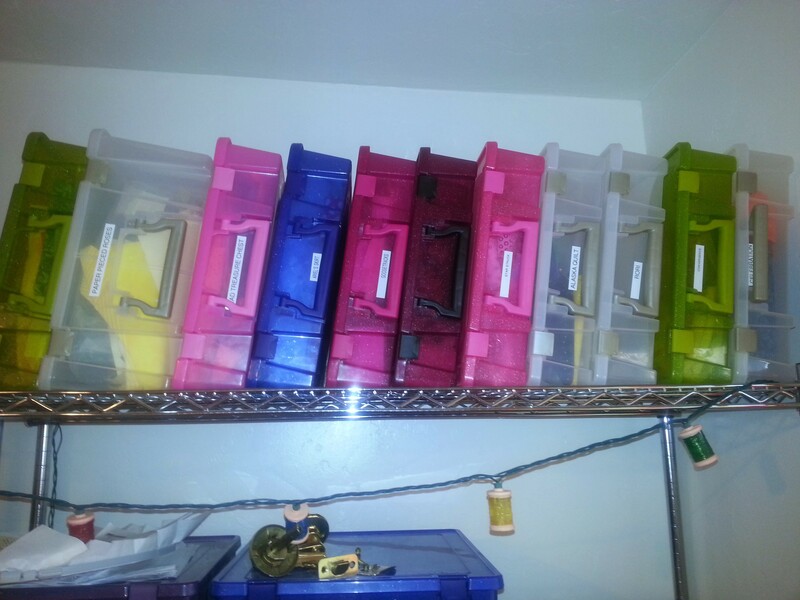 If nothing else, it will open up storage space. If the answer is no, ask yourself if it is worth keeping. In January, I set a goal to complete a project a month. This started as a way for me to attack my UFOs. I am 3 months into the year and have completed 3 projects. Every one of them I did from start to finish. I think it is time to get back to my original plan. Here’s to accepting that colors change and we are all a little better than we were.